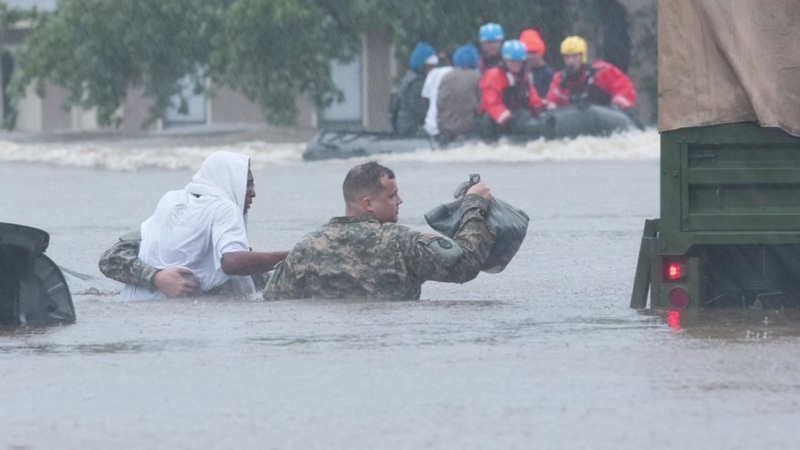 FAYETTEVILLE, North Carolina -- Matthew was long gone from the Atlantic coast early Monday, but the devastation lingered, most notably in North Carolina, where flooded cities tried to dry out and those downstream kept a close eye on rising rivers. Thousands of people found themselves suddenly trapped in homes and cars during the torrential rains. Rescuers in Coast Guard helicopters plucked some of them from rooftops and used military vehicles to reach others, including a woman who held on to a tree for three hours after her car was overrun by flood waters. The storm killed more than 500 people in Haiti and at least 18 in the U.S. - nearly half of them in North Carolina. Most were swept away by flood waters. North Carolina Gov. Pat McCrory said Sunday that authorities were searching for five people and feared they may find more victims. David Bullock's sister called him as he bought lottery tickets to tell him police were knocking on doors saying they had to go. He rebuilt his home after the 1999 flood. "If I get flooded again, I can't take it. I can't go back and take the expense. If I get flooded again I'm going to say, 'it's yours, I'm gone,'" Bullock said. 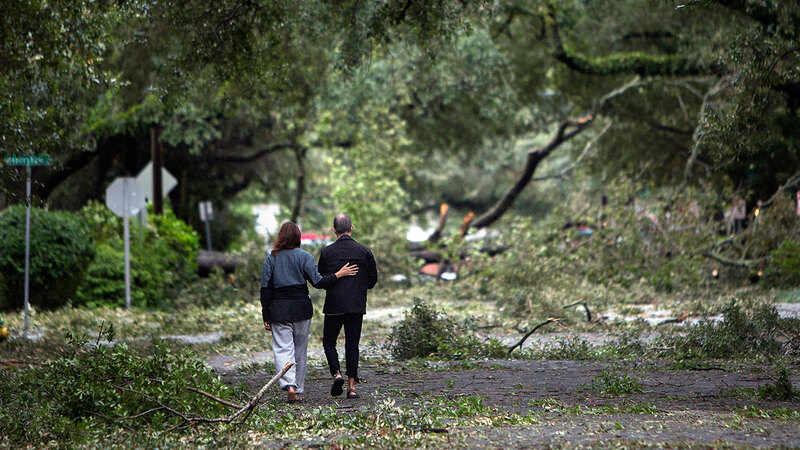 More than a million people in South Carolina and North Carolina were without power, and at least four separate sections of Interstate 95 - the main artery linking the East Coast from Florida to Maine - were closed in North Carolina. "I was scared. I was scared. And I thought, I thought the world was going to end. But it didn't," he said. In Wilson County, rescuers were called when a 63-year-old woman didn't make it home from work. They heard her cries for help while riding on top of a Humvee, and when they couldn't get her with a rope, a National Guard soldier swam to her, staying until a rescue boat arrived, Emergency Management Director Gordon Deno, said. Even animals had to be saved. WRAL-TV showed a dog swimming around floodwaters Saturday. McCrory said he and his wife were riveted by the coverage and relieved to find out from the Coast Guard that the dog managed to get into a tree and they rescued it. Shortly before daybreak Sunday, the hurricane was downgraded to a post-tropical cyclone. As of 2 p.m. EDT, the storm was centered about 150 miles east of Cape Hatteras, North Carolina, moving out to sea. It still had hurricane-force winds of 75 mph. Debbie Berta said she waited more than an hour to get propane gas for her grill. She also wanted "bread, potatoes, eggs - and a piece of sanity." "People were hit. They weren't hit as directly as we had feared, but it has left a lot of devastation in in its wake. Lives have been lost, property has been severely damaged and there's still continuing risk of flooding going on," President Barack Obama said at a fundraiser in Chicago.